How you feel can sometimes have an impact on how much you weigh. What do your emotions have to do with your body weight? For many people, eating is closely linked to emotions. Negative emotions can trigger a craving for foods that are high in sugar or fat, which may help us feel better for a moment but can also lead to weight gain. We may also eat unhealthy foods to celebrate positive emotions – like the birthday cakes we serve at parties or the drinks loaded with calories we share with friends. 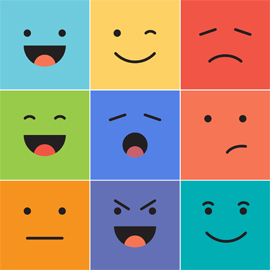 In addition to affecting what we choose to eat, emotions can also effect how our bodies process food. Stress, for example, can cause an increase in cortisol and other stress hormones. These hormones have been shown to change the way body stores fat, causing an excess of belly fat and potential weight gain. What can be done about these links between emotions and weight gain? Take steps to mange your stress and become aware of emotional eating habits you may have. Look for coping strategies and social traditions that don’t revolve around unhealthy foods. Try exercising to deal with stress or suggest getting together with friends for an outdoor activity. Bring healthy snacks to social gatherings and keep your favorite comfort foods out of the kitchen.